Huan Xiang, Male, born in 1910 as a native of Zunyi, Guizhou Province, bachelor’s degree. He was a senior diplomat, a prominent expert in international affairs and a social scientist in China. 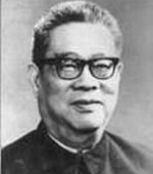 1945-1949, served successively as Deputy Editor-in-chief of Wenhui Daily in Shanghai, Chief Editorial Writer of Progress Daily (formerly Ta Kung Pao) in Tianjin, and Deputy Secretary-General of the Preparatory Office for the Chinese People’s Political Consultative Conference and Director of Information Services. He was awarded an honorary Doctor of Laws degree by the University of Glasgow in the United Kingdom in June 1980 and elected Honorary Fellow of London School of Economics and Political Science in 1981. He was member of the First National Committee of the CPPCC National Committee, representative and member of Standing Committee of the Sixth National People’s Congress.